YOU'RE GOING TO LOVE YOUR SKYLINES PUREBRED ROMNEY & ROMNEY-CROSS SHEEP! Since 1992 I've been carefully building a "dream flock"...one that reflected my personal values while meeting my financial goals at the same time. The result of this focused effort is a profitable flock of beautiful, superbly healthy, productive sheep that have been bred for many generations to excel under an organic, sustainable, grass-based system. Start your new flock out right with SkyLines genetics...or add them to your existing flock...and you can reap the benefits of my years of work! In August the best of the year's lambs are ready to go to their new farms. Reservations for ewe lambs and ram lambs are accepted all year round. UPDATE: After 21 amazing years, in fall 2013 I retired from the sheep portion of my business! The wonderful shepherds of Ramstead Ranch in Ione WA have purchased the very best SkyLines sheep to add to their breeding flock. These folks follow the same organic and sustainable methods as I do, on their gorgeous 120-acre grass-based operation. Scroll down for complete details on SkyLines Farm's 21-year breeding program and the incredible quality of fleeces, breeding stock, and freezer lambs the flock produces. Some of the SkyLines Romney & Romney-cross ewe lambs, at about 9 months of age. These grassfed beauties have since matured and joined the SkyLines breeding flock. Since 1992 I've been slowly and carefully building my ideal flock of purebred Romney and Romney-cross sheep. Achieving the ideal flock meant that in most years I kept only the top 20-25% of ewe lambs born that year, rigorously selecting for the qualities that were important to me. It's been a long slow process, but I now have the high quality 50-ewe flock I envisioned years ago, the kind of flock I'd like to buy from myself. My Ideal Sheep . . .
Hardy breeding stock for shepherds focusing on similar markets and production practices. My Specific Breeding Goals . . .
Each of the SkyLines purebred Romney sheep meets the ARBA (American Romney Breeders Association) standards for conformation. In addition, for the purebred Romneys as well as the crossbreds, each sheep must also meet my own personal standards for beauty and productivity . . . I look for a sheep with a sweet, open facial expression and nice calm personality, soft, lustrous, high-value fleece, and the physical characteristics to be low maintenance and to perform well on grass. Basically, this means I want her to be medium sized, standing fairly low to the ground, with a wide midsection providing lots of room for forage, well spaced hips for easy lambing, and a straight, moderately long back. She's not a flashy show sheep. My ideal sheep's beauty is in that she looks "sturdy" and "productive," while also sporting a heavy, gorgeous fleece that handspinners prize. Not having a crew to help with lambing, I just can't handle the typical lambing season that many producers suffer through . . . long cold nights in the barn helping deliver stuck lambs, long days nursing weak or sick lambs, dealing with prolapsed ewes, feeding numerous bottle lambs, etc. Thanks to a carefully designed management program, plus rigorous culling over the years, my girls are now doing their fair share of the work. They almost always deliver their lambs during daylight hours and come inside the barn if it's foul weather, very very rarely need lambing assistance, produce twins regularly, produce large amounts of rich milk, and take excellent care of their lambs from birth to weaning. Flock Records: In addition to pedigrees on every animal, I've kept very detailed lambing and flock health records since I began shepherding in 1992. This is extremely useful information to me. As one example, in the year 2000 I was able to eliminate the dreaded middle-of-the-night barn checks, when 8 years of records made it clear that virtually every ewe in the SkyLines flock has her lambs between the reasonable hours of 5am and 10pm and that I've had to assist in only 2-3% of births in my worst year (still true - hurrah!). Result: These girls are so self-sufficient that I'm able to deal with lambing out 50 ewes by myself and friends say that I only get a little crankier than normal! SkyLines grassfed lambs reach an average market weight of 90-100 pounds in 6-7 months on only mom's milk and high quality pasture. 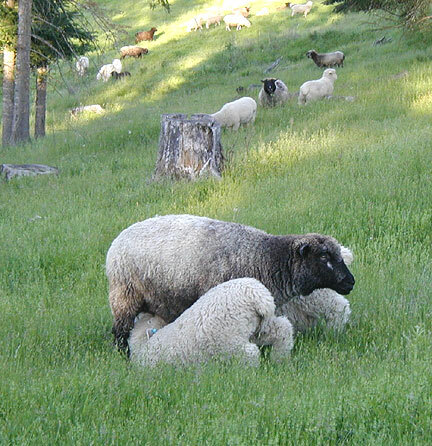 Grain-fed Romney lambs can reach somewhat higher market weight, but I decided back in 1999 that I wanted to get off the fossil-fuel-intensive grain treadmill and start transitioning the flock to Nature's way, which is grassfed. Since then I've never looked back, and my customers thank me for it. Year after year, they rave about the sweet, fresh taste and the wonderful leanness of their SkyLines lamb. Happily, the word is finally beginning to get out to the public why raising ruminant animals on grass alone provides significant benefits for the environment, for our animals, and for our own health (check out www.eatwild.com for the whole story.) Note: The pregnant and nursing ewes receive a small amount of daily grain during the winter to supplement their hay. They are, after all, busy growing exquisite high-value handspinning fleeces in addition to multiple lambs! Each sheep in the flock also needs to produce an exquisite, high quality fleece for the handspining market every year. I want fleeces that are strong, long, lustrous, and full of life, with an ideal net weight of 7-8 lbs after aggressive skirting. Since I don't coat fleeces, they should shed VM easily, and not get overly tippy or weathered. I select for a range of fleece styles and beautifully variegated natural-colored fleeces, to satisfy a variety of spinners' desires. After years of continuously improving my fleeces through genetic selection and better management practices, many of each year's fleeces are now being reserved long before shearing day and the rest sell out within months after shearing. This tells me that the SkyLines sheep are meeting my production goals as well as the desires of my customers. 5) Finally, I want sheep that are calm, even tempered, easy to manage and work with, stay together as a flock, stay inside my fencing, and are naturally resistant to foot rot and internal parasites. Running a Closed Flock . . . Since purchasing my original five ewes in 1992 I've brought in new registered Romney rams every few years, but bred every one of my own ewes. I've intentionally kept a nearly-closed flock to focus on developing a line of sheep that meets my specific requirements, and also to minimize the chances of new animals bringing disease onto the farm (biosceurity is an important element of any organic management program - see Management Practices pages for more info). The new registered Romney rams I've purchased have helped to broaden my available genetic pool, and beginning with the '06 breeding season I've used rams of my own breeding as well. About half of the SkyLines breeding ewes are purebred Romney. The other half of the ewes are selected Romney-Montadale crosses. The crossbred girls are primarily Romney, with just a touch of Montadale. These two breeding lines give me the variety of fleece types that interest me the most, and that sell out to spinners every year (see Fleeces above). SkyLines lambs grow up the natural way . . .
SkyLines Farm's lambs are raised using a blend of time-tested organic and sustainable practices that respect the animals as well as the land (not certified organic). SkyLines lambs are 100% grassfed and grassfinished. They spend the entire summer on pasture happily grazing a rich variety of grasses and forbs alongside their moms, and they're weaned naturally by mom when she's ready, at four to five months of age. A variegated natural-colored Romney ewe nurses her chunky white twin lambs. No vaccinations, absolutely no chemical wormers, no antibiotics, no growth hormones, and certainly no supplemental feeds like grain to make them reach market weight in a big hurry. Are making the greatest amount of growth on only mom's rich milk and the farm's lush green grasses. By late summer I make my final decisions on the very best ewe and ram lambs of the year. These lambs I either keep for myself or offer for sale to other shepherds. The rest are identified as market lambs. Visit the sheep and their fleeces online . . .
To view many more photos of the SkyLines lambs, ewes, and rams in their natural environment on the farm, check out the Photo of the Day-Week-Month pages. SkyLines fleeces sell out every year to handspinners across the country. To get a close look at the exquisite, top-selling, handspinning fleeces produced by the SkyLines flock, see photos of every fleece at the Handspinning Fleeces pages. To reserve your SkyLines (now Ramstead Ranch) lambs . .
Each year's lambs are weaned and ready to go to their new homes in early-mid August. Reservations for lambs are accepted all year round, with a nonrefundable deposit to hold each lamb. When the lambs are ready to go in August, lamb pickups are scheduled in the order they were reserved. First to reserve gets first pick of their lambs. SkyLines lambs have sold out out every year for many years . . . reserve yours from Ramstead Ranch early! Consider adding SkyLines genetics to your own flock, for improved, heavy-shearing handspinning fleeces & fast growth on grass alone! 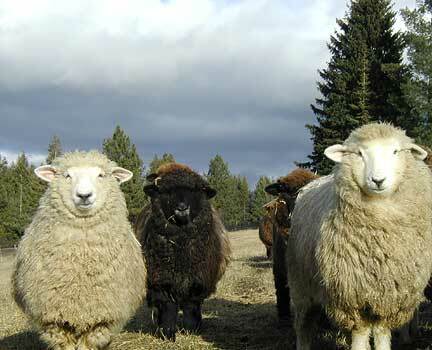 Contact Eileen Napier at Ramstead Ranch for lamb availability and to arrange for a farm visit.